The Brouzils Seminars › The Literary Arts Programs of the Brouzils Institute. The Brouzils Seminars and Workshops 2016-17. The Brouzils Seminars and Workshops – a series of small, unique, highly goal-driven, limited-term residency and mentorship programs intended for serious participants who wish to work in collaboration with accomplished professionals in a pleasant setting well away from the familiar surroundings of everyday life. Every workshop, seminar and mentorship is organized around a specific goal, usually one leading to publication. We’re not your usual writing program. Our longest combined session lasts four weeks. We’re not going to be able to teach you to write in four weeks. In fact, we assume from your interest in joining us that you already know how to write. You just don’t know what to do with what you write. Our interest is in providing practical information for literary artists. Perhaps you already have a British or American degree but your coursework left you with little sense of how publishing works, or maybe you’ve sat through enough read-and-discuss seminars to last the rest of your life and now you need to find the next step forward to publication. Or perhaps now you have a manuscript in progress – but you aren’t certain what you’re going to do with it when you’re done, especially since the publishing industry is in the kind of chaos unseen since Aldus Manutius. Maybe the method of presenting your work needs attention before you can move it up a level, or maybe you’re discovering that finding a reputable literary agent is the stuff of dreams. We want your writing to work for you, and for your calling – and for your career. The focus at Brouzils is project completion. Since its inception, Brouzils has offered graduate and undergraduate academic credits through its American affiliate for work completed here. Beginning in 2015, we transitioned away from this model. There are already enough writing programs for student writers. Our emphasis now and in the future will be on helping and supporting active writers and furthering literary projects that we believe can be brought forward and launched in practical, directed ways to best insure ultimate success. Already-completed projects will be shaped and refined to make them more appealing to agents, publishers and readers, but our commitment will be to new work and new projects and to new ways of thinking about literature and literary platforms. Alternative approaches to publication will be explored and analyzed on a project-by-project basis. No matter where you are starting, by the time you leave Brouzils, you will have taken the next step forward. So, beginning in 2015, we no longer accept applications for our traditional graduate and undergraduate writing seminars. We will, however, continue our practice of offering individual mentorships and fellowships for those who wish to complete works-in-progress with professional guidance. The popular, ongoing memoir-writing project for those with a private tale to tell will also continue throogh 2017. And of course there are our individual retreats for practically anyone with an unmet creative ambition. 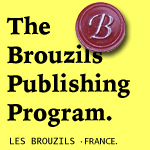 The biggest change in 2015 was the launch of the Brouzils Publishing Program. In response to the changing environment for writers and for publishing, and in response to queries from past and potential participants, we created a two-week workshop designed to help participants create published books before they leave. It’s a very different way to run a writers’ program, but we think participants will be happy with what we’ve put together. For more details, see this page. Continuing: Online participation in some of the Seminars’ most popular goal-driven programs. Click here for details. The Brouzils programs are led by men and women who have demonstrated considerable accomplishment in the areas they teach: Screenwriting, poetry, fiction, journalism and creative non-fiction, documentary films, children’s literature, illustration, memoir and political commentary. For details, visit our faculty index page. The distinguishing characteristic of all Brouzils programs is the goal-oriented nature of the sessions. The programs are all designed to provide participants with the opportunity to complete one or more critical and necessary steps leading to the publication or production of their work. While the Brouzils faculty members all understand, appreciate and wish to encourage mastery of the technical elements of writing in all genres, the underlying assumption is that those coming to Brouzils will want to leave with a finished treatment, a completed book proposal, a revised manuscript or some other important and essential component of work newly conceived or already in-progress. We believe serious writers write to be published and our mission is to help them reach that goal. The ideal seminars participant is a serious but perhaps unpublished writer, possibly a post-MFA student who has been given a degree – but who has also been left without useful professional tools necessary for success as a literary artist. The Brouzils seminars are intentionally small and the “sharing and caring” features of many writing programs are not important here. Our focus is on real-life progress toward a narrow, well-defined goal. Many participants return often, creating the sense of an unobtrusive community. 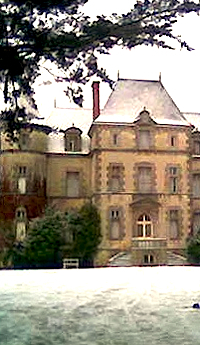 Location: The seminars meet in the small, private chateau opposite the village church in the heart of the Vendéen bocage. Additional workshop courses meet in the early 19th century seminary building in a nearby village. In addition to those rooms provided as part of the seminar and workshop fees, there is wide range of comfortable, attractive alternative accommodations available in the immediate area. By rural train, the village is about 30 minutes from Nantes and about an hour from the beautiful beaches of the Vendéen coast. TGV trains connect Nantes with Paris and the outside world. For dates, fees, faculty and other details about the Institute’s programs and seminars, please click one of the following announcements. NOTES ON WORKSHOPS & SEMINARS. Enrollment is strictly limited. Space and accommodations by individual arrangement are provided once admissions requirements have been met. Summer Seminars sessions are accredited for both graduates and undergraduates by our American academic partner. Please inquire for details. FALL/WINTER :: Individual private, mentored retreats. Limited space for working writers and artists is available year-round. One-week minimums apply. YEAR-ROUND :: The Brouzils/Fortnightly Review Editing Practicum. Our individual mentorships have grown to include this advanced-level, hands-on course in book, periodical and journal editing and publishing history. Other programs may be added to this list. To be advised of changes and additions, please contact us by email: info @ brouzils.org. Filed in Uncategorized | | Comments Off on The Brouzils Seminars and Workshops 2016-17.